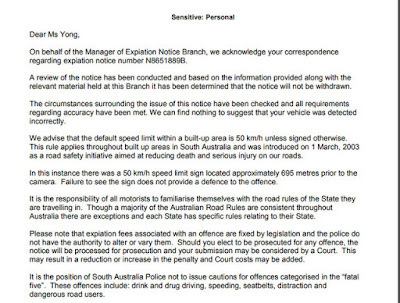 Recently I received in the mail, a traffic 'expiation' notice from South Australia Police. "Expiation" - to make amends or reparation for. I find it ironic that I was sent an "expiation notice" expecting me to feel sorry for some offence that was trifling. The offence was recorded by the camera at 5:59pm (in winter) at McLaren Vale (near the Mclaren Vale touristy area, no less). At 5:59pm, it was pitch dark. The fine? A hefty exorbitant $431 Australian Dollars. 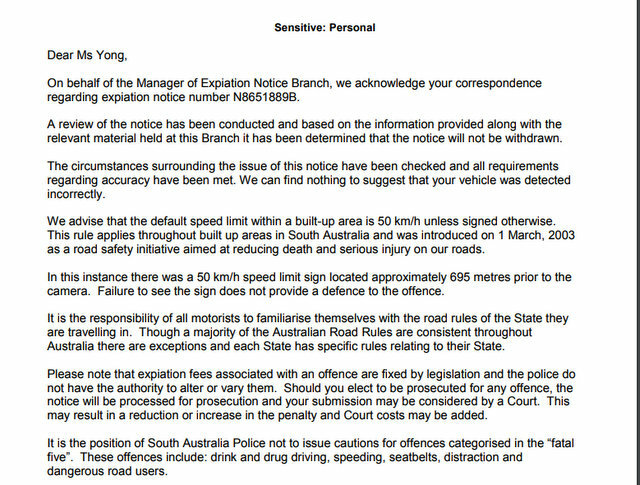 So I sent in an email to SA POL explaining the reasons/factors why I felt the offence was trifling. 1) We were inter-state visitors to Adelaide. It is impossible for interstate first time drivers to know what the local speed limits are. 2) It was 5:59pm (in winter) in Adelaide when the offence was recorded by the camera. It was pitch dark when the camera recorded the offence, so it would not have been impossible for us to see where were going. 3) The fine is exorbitantly high for the offence committed. It is not possible to avoid doing so as we were going down a hilly area (meaning steep). Today I received a reply from SA POL. The information is SENSITIVE? Not really. Not if they were to fine motorist for offences as trifling as this. It is more reason that I should publish it on my blog for all my readers to READ it so that they know how NASTY the SA POL is of the general public and motorists. 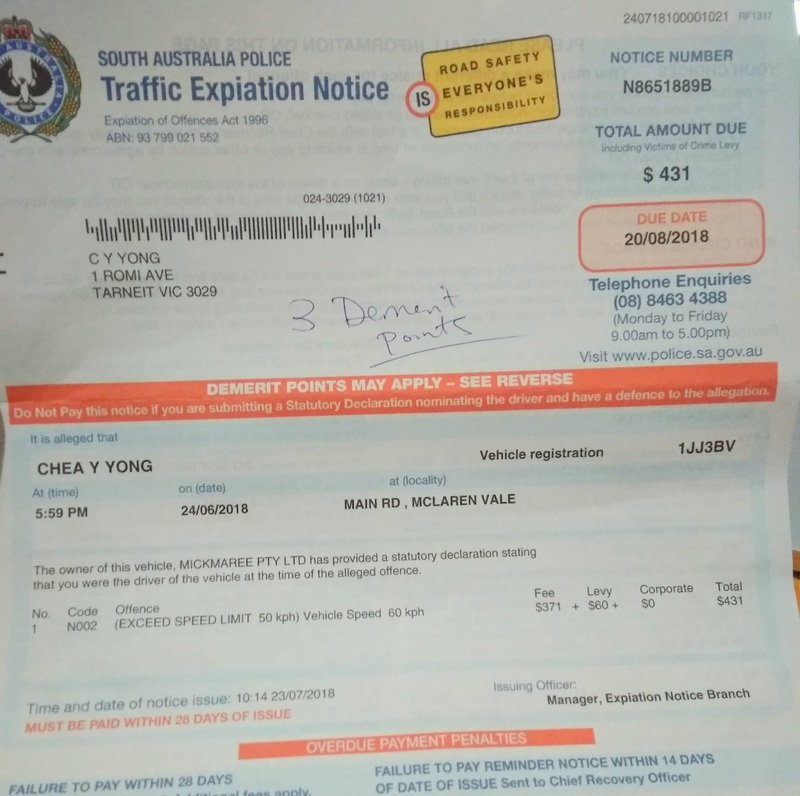 When I called up SA POL, apparently there is 3 Demerit points associated with this offence. I then asked her if I could extend the time to pay the fine, or go on a payment plan, she had the gall to ask me why? I told her that "IT IS EXPENSIVE". If you think about it, it is almost three weeks rent for most people. For families, that is enough to feed a family of four for at least one month. It is my lunch money for at least one month. So not only does SA POL does not care if you are poor, or rich, their staff are not respectful as well. They are quite happily creating revenue for themselves out of motorists. They claim that they PROTECT the people from traffic offences. But they don't give leniency to people who are just making ends meet, and just trying to make a living. To add to that, the SA POL is not transparent in their dealings. 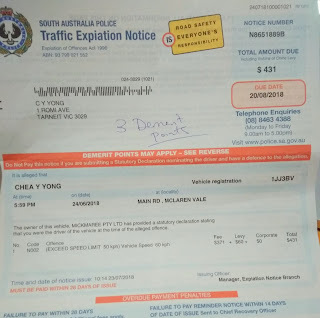 They did not even disclose the offence attracted 3 Demerit Points until I called up to enquire about it. This makes me feel that there is not much transparency in the way that SA POL handles the issuing of offences and makes it suspicious in their dealings. The fact that they put a traffic camera near Mclaren Vale shows that they want to rake in revenue from all the unsuspecting tourists who would like to visit Adelaide and also slap them with 3 Demerit points. I am still working on what to do at this time. In the mean time, I may have to contact lawyers to work out what my next best of action to be.